In 1931 it was decided to dig a channel (Lekkanaal) to connect the river Lek and the Amsterdam-Rhine Canal. Apart from the vertical-lift steel gates, the 18 metre wide side-by-side locks are entirely of reinforced concrete. The lifting towers also contains the vertical access to the elongated service rooms up above with their rounded end of canopies and balconies. 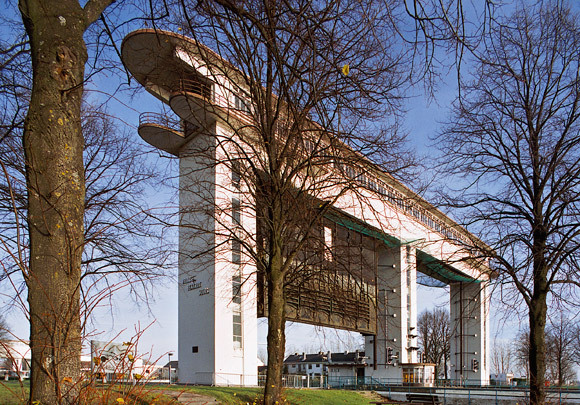 The lockhouses are a fine example of the functionalist architecture of the national water authority (Rijkswaterstaat). A control station on the common middle wall was demolished in 1997 to build a new bridge, part of a motorway approach road.